Jean Todt is no stranger to travel. He is the President of the FIA, Fédération Internationale de l’Automobile, an organisation which oversees motorsport and promotes road safety. His work takes him around the globe. Travel is nothing new for Mr Todt. He would grace television screens most weekends during the Formula One season, sat at the pitwall. His immense intelligence was successfully employed in the higher echelons of motorsport, masterminding strategy. 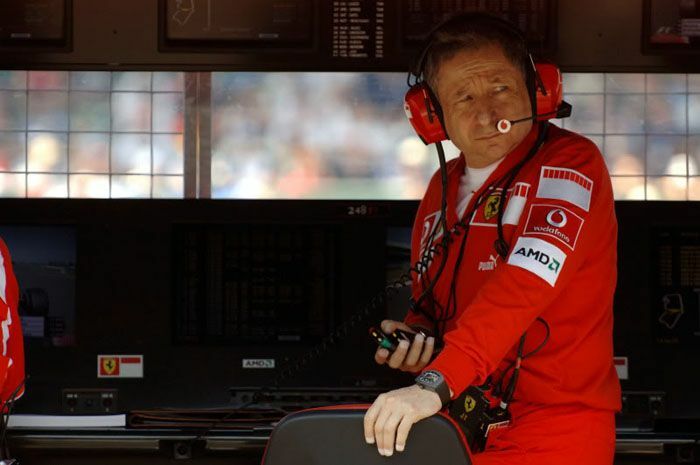 He was instrumental in helping Scuderia Ferrari secure 14 Formula One World titles and 106 Grand Prix victories. Whilst travel is often perceived as glamorous, when it becomes part of your regular working routine, it can be tiring. Moreover, different timezones can prove confusing to even the most seasoned globetrotter. It comes as no surprise that Richard Mille, personal friend to Jean Todt, conceived a world time watch to help his friend. This complication has been seen on models from other watch companies, however, typical of the Richard Mille brand, engineering excellence is assured. The horological cognoscenti have grown to expect Richard Mille to deliver “out of the world ”timepieces with his “out of the box” approach to conceptualising watches. With the RM58-01, Mille does not disappoint with a spellbinding technical fest of elevated engineering. However, despite the complexity of the construction, the operation of the watch is still simple and user-friendly. Red gold hands, lined with luminous material, convey the hours and minutes. At 2 o’clock, a power-reserve indicator features. It reminds me of a fuel gauge in appearance. Indeed, Richard Mille have never ceased embracing automotive influences in the creation of his timepieces. At 9 o’clock the tourbillon cage sits proudly. It is unusual to combine a worldtime function with a tourbillon movement. Yet, Richard Mille has never followed convention and has sought his own singular path to horological excellence. The wearer is often indulged with a view of the magnificent micromechanics on Richard Mille watches and the RM 58-01 is no exception. It titillates the eyes with resplendent rubies. The outer city ring frames the dial, whilst adjacent, a 24-hour scale sits on a lower disc. The wearer turns the bezel anticlockwise and places the desired city at noon to automatically set the local time. They are then able to see the time in 23 other international cities thanks to the hours shown on the lower disc. Moreover, numbers shown on the lower disc are presented on a white or black background dependent on whether it is day or night. This is a huge watch measuring 50mm in diameter with a case height of 15.35mm. It may prove too large for some, but I thought it was fantastic when I saw the timepiece at SIHH 2013. Richard Mille, the brand, is known for its tripartite cases which necessitate incredible engineering to bring to fruition. In this instance, the case is not formed of three parts but four. The additional component, being the rotational bezel. Indeed it is the bezel, whilst proffering user-friendly operation, that presented many challenges to the engineers at Richard Mille. The bezel operates the worldtime indication as well as moving the hour and minute hands. 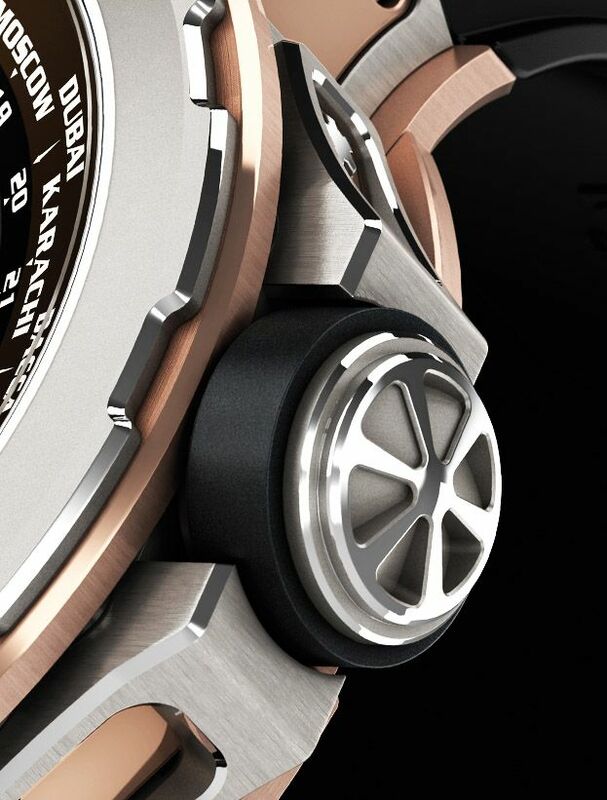 This, by its very design, could compromise the water resistance of the watch. However, rest assured, the watch is water resistant to 30 metres. The key constituents of the case are brought together with a combination of 20 grade 5 titanium spline screws in combination with two Nitril O-ring seals. 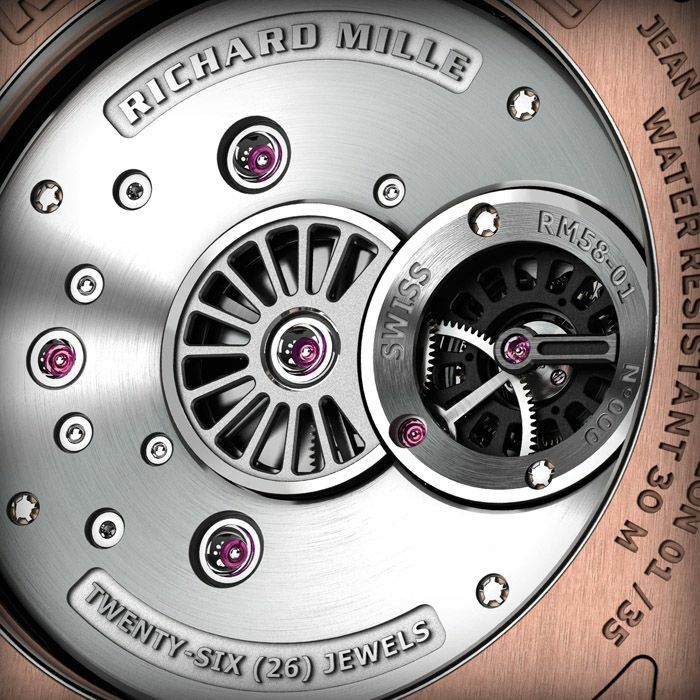 Richard Mille use spline screws as they can be tightened to a pre-determined torque. Moreover, they can be tightened, loosened and tightened once more without any signs of adjustment. It may sound like a small detail, but it is this type of minutiae which heightens the pleasure of ownership. Short horns draw the rubber strap close in purposeful union. They allow the strap to embrace the wearers wrist, ensuring the large case sits snugly on the majority of arms. The rubber strap is joined to the case with grade 5 titanium screws in a steadfast marriage of materials. A particular flourish of style that I like, are the exposed sections of the spline screws which span the caseband. The word “titanium” can be seen on one edge, proudly presented in capitalized text. A sapphire caseback allows the wearer to view the grade 5 titanium mainplate. It has an almost space age appearance and does not eschew the elevated craftsmanship associated with high-end watchmaking. Furthemore, several stones have been set in white gold chatons reinforcing the perception of distilled excellence. The Caliber RM 58-01 is manual winding. However, wearers will not have to remove the watch too often from the wrist, thanks to its impressive power reserve of 10 days. The prodigious power reserve is courtesy of twin barrels and the parsimonious thirst of the highly efficient movement. As you examine the Caliber RM 58-01 you will not see Côtes de Genève motif on bridges, blued screws or perlage on the plate. These examples of finishing, often found on fine Swiss movements, are absent in this case. However, do not think fine finishing has been overlooked. 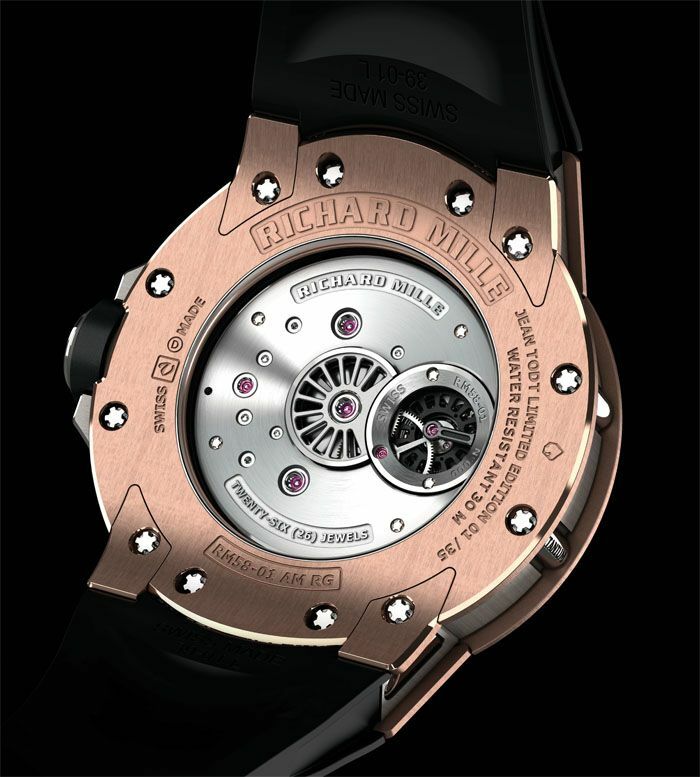 The movement features hand-polished beveling, burnished pivots and circular grained bridge surfaces. Steel parts have drawn edges, anglage and are polished by hand. Contemporary watchmaking does not mean purchasers are shortchanged but rather they are presented with neoteric finissage befitting the modernity of the watch. Richard Mille don’t emulate others, but rather, relentlessly pursue answers few companies even thought to ask. Take the torque limiting crown for example, it is fitted with a safety mechanism which prevents the movement from accidental overwinding. Eminently sensible on reflection, it is just one example of the “blue sky thinking” which justifies the premium pricing of the Richard Mille branded watches. Several years ago, I recall seeing images of Richard Mille watches in a magazine and, to my shame, casually discounting them as “fashionable” and “trendy”. I was foolish to have formed this opinion at the time. 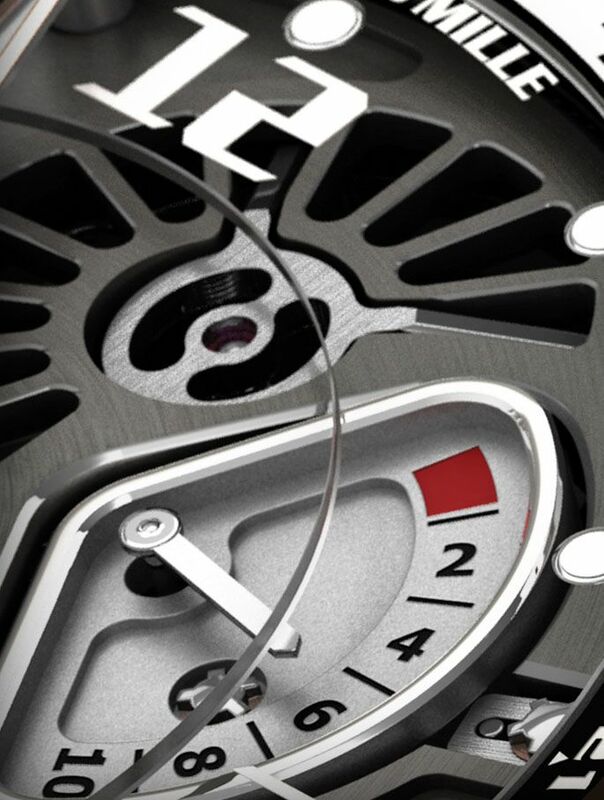 In recent years, I have grown to learn more about the motorsport inspired timepieces which embrace space-age materials. In 2012, I visited the production facilities of the company and saw first hand the exhaustive processes required in making a Richard Mille timepiece. The case construction of RM 58-01 consists of nearly 200 parts and a vast number of processes to produce its pleasing form. The predilection for pushing limits, thinking of innovative methods of imparting time and meeting the needs of specific individuals is what makes Richard Mille a very special brand indeed. Incidentally, the profits from the sale of the RM 58-01 will be transferred to the Global Campaign for Road Safety as well as the ICM Brain and Spine Institute, which Mr Todt co- founded. Wherever Mr Todt travels he can look at his watch and derive pleasure from knowing the sale of it will help causes close to his heart and see the prevailing time courtesy of the user-friendly RM 58-01. Case: 18-carat red gold and grade 5 titanium; diameter 50.00 mm; height 15.35 mm; Water resistant to 3 bar (30 metres); sapphire crystal to front and rear. 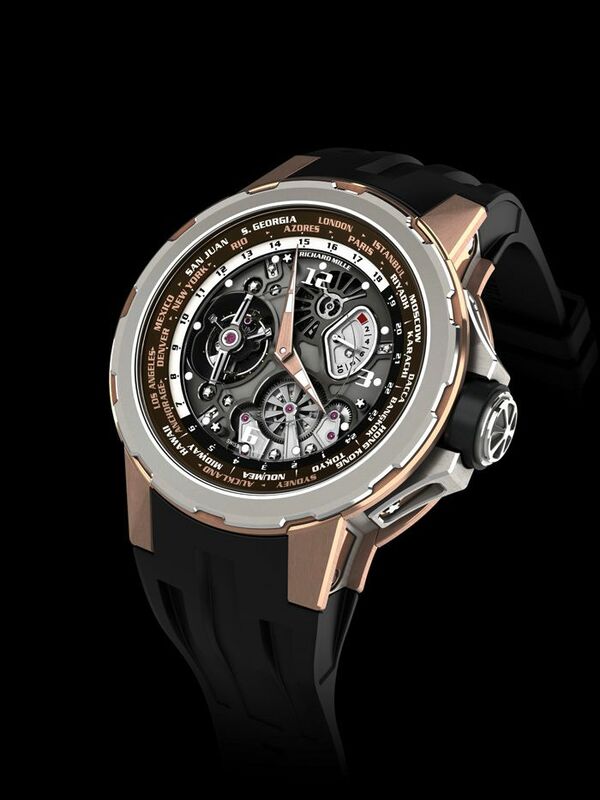 Functions: Hours; minutes; power-reserve-indicator; world time function with 24- hour time display; tourbillon. Movement: Caliber RM58-01; manual-wind; frequency 21,600 vph (3 Hz); 41 jewels; power reserve 10 days.